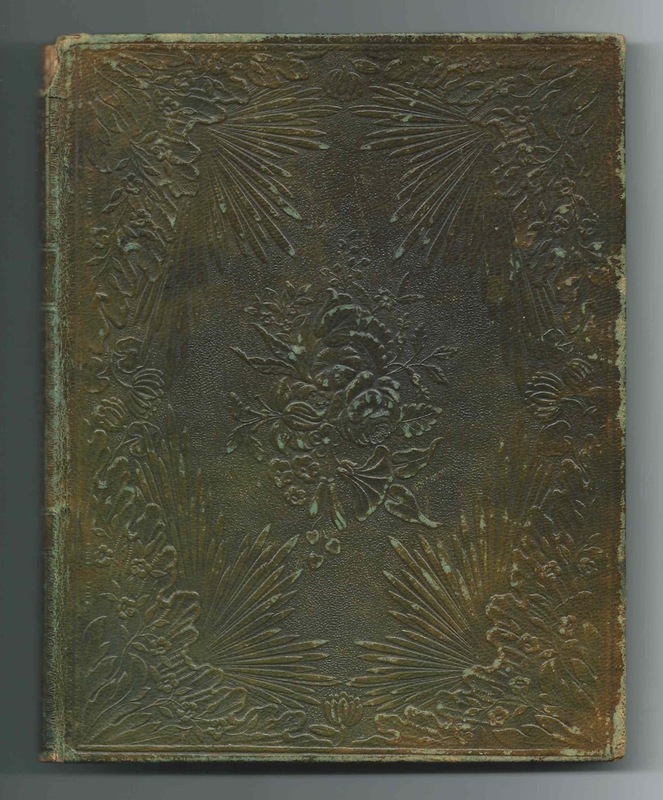 1852-1856 autograph album that belonged to a Hattie, who may have lived at Hanover, New Hampshire, where the majority of well wishers inscribed their pages. She may have been Hattie Hubbard. 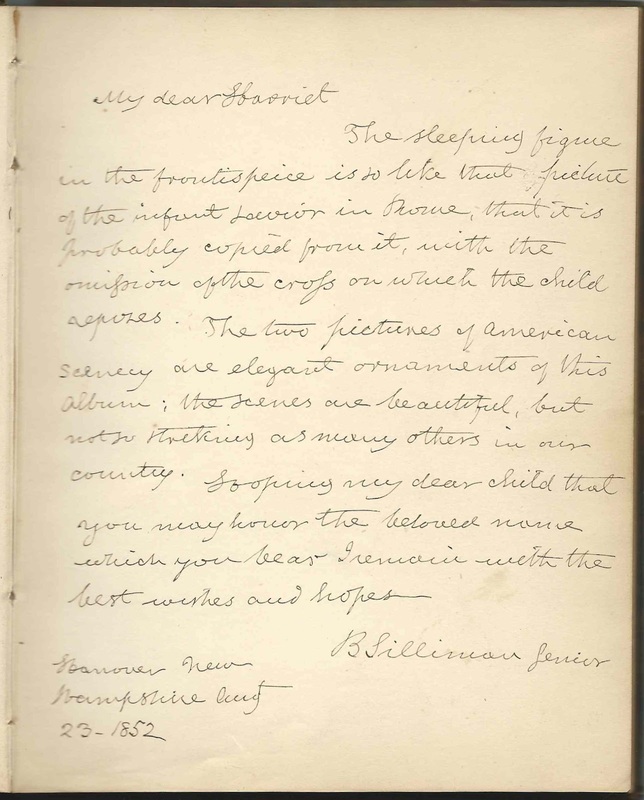 The first page in the album was inscribed at Hanover, New Hampshire, on August 23, 1852, by B. Silliman, Sr. He was presumably professor Benjamin Silliman, Sr., of Yale College, whose daughter, Faith Wadsworth Silliman, married her father's assistant, Oliver Payson Hubbard, who became a professor at Dartmouth College at Hanover, New Hampshire. The couple had at least two daughters, Harriet Trumbull Hubbard, born about 1838, and Henrietta Whitney Hubbard, born about 1840. 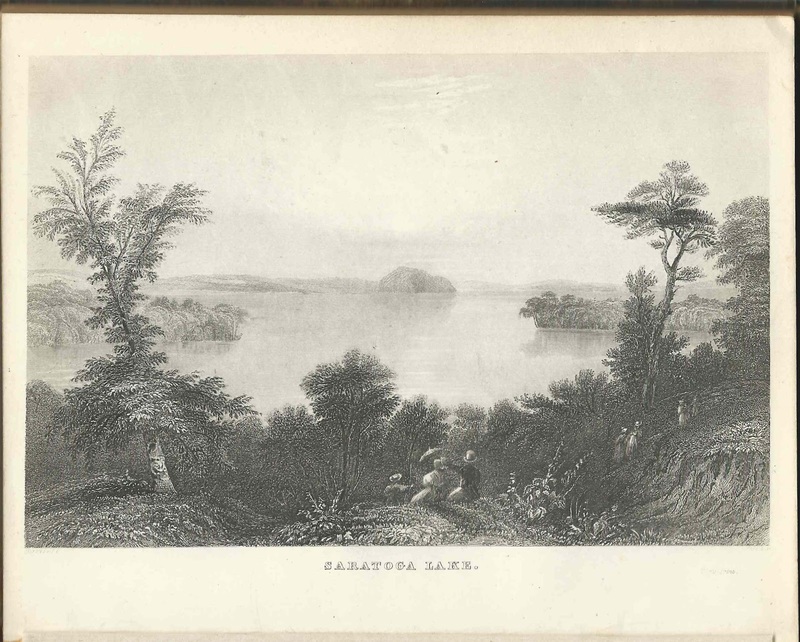 The album measures approximately 7-3/4" x 6-1/4" and contains the sentiments of 37 of Hattie's friends. An alphabetical surname list and an alphabetical list of the signers, together with any personal information they offered, appear at the end of this post. 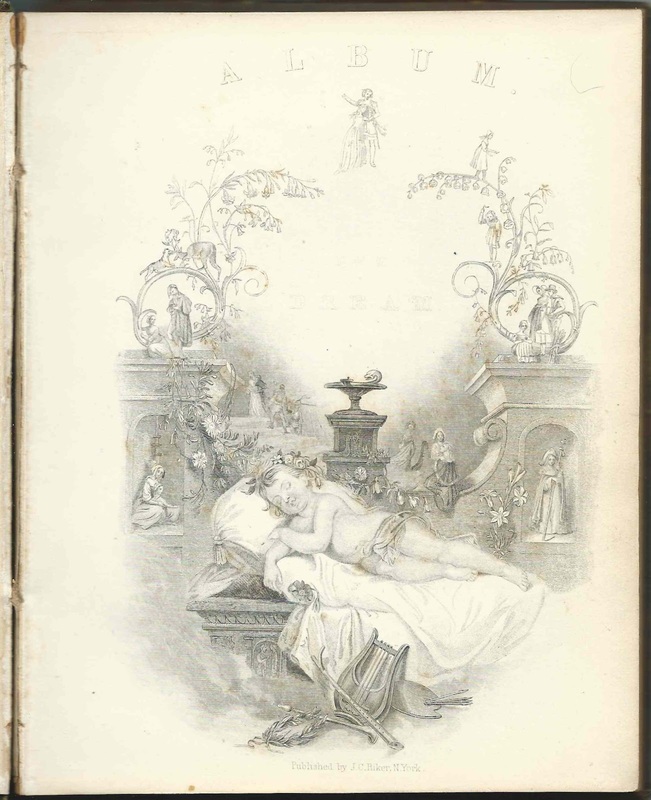 The album is a fancy one, published by J. C. Riker of New York, with engravings scattered throughout. Several people with the surname Stowe signed pages in the album, including an H. B. Stowe, who may have been Harriet Beecher Stowe. Her signature does resemble the authenticated signature below. Alternatively [thanks to a reader - see comments], this could be the autograph of Harriet (Beecher) Stowe's daughter Harriet Beecher Stowe, born in 1836. 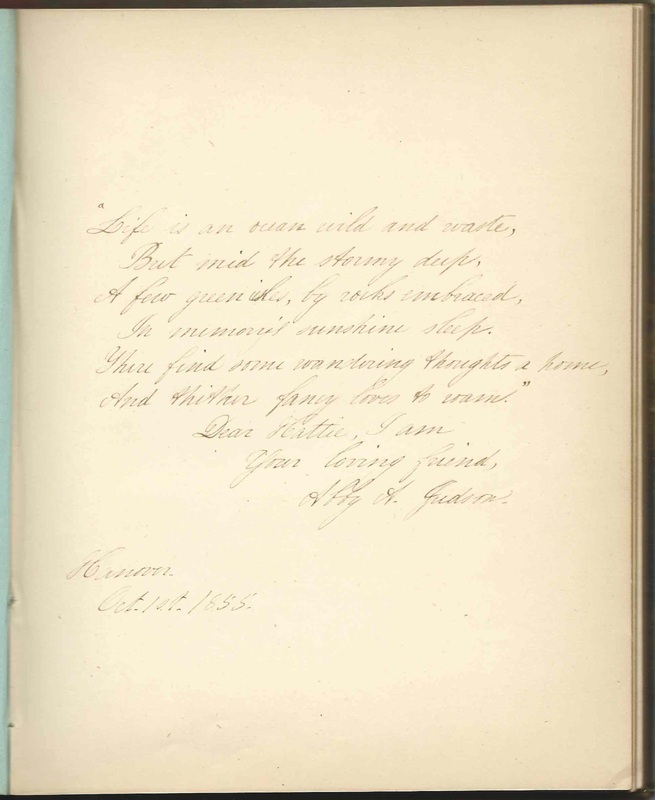 Abby A. Judson inscribed a page at Hanover, New Hampshire, on October 1, 1855. She was presumably the Abby A. Judson who was the daughter of Adoniram Judson, missionary to Burma, and his second wife Sarah (Hall) Judson. Abby became a noted spiritualist. If you have a theory as to Hattie's identity based on the list of signers, or if you have information on any of the signers listed below, please leave a comment or contact me directly. Thanks! 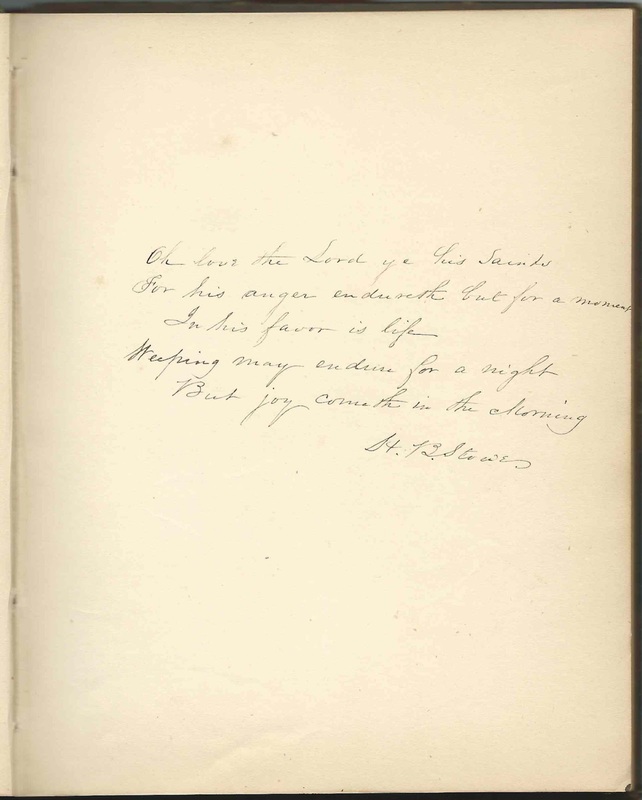 Facing pages signed by L.D.W. Very faint. First name possibly Hattie. 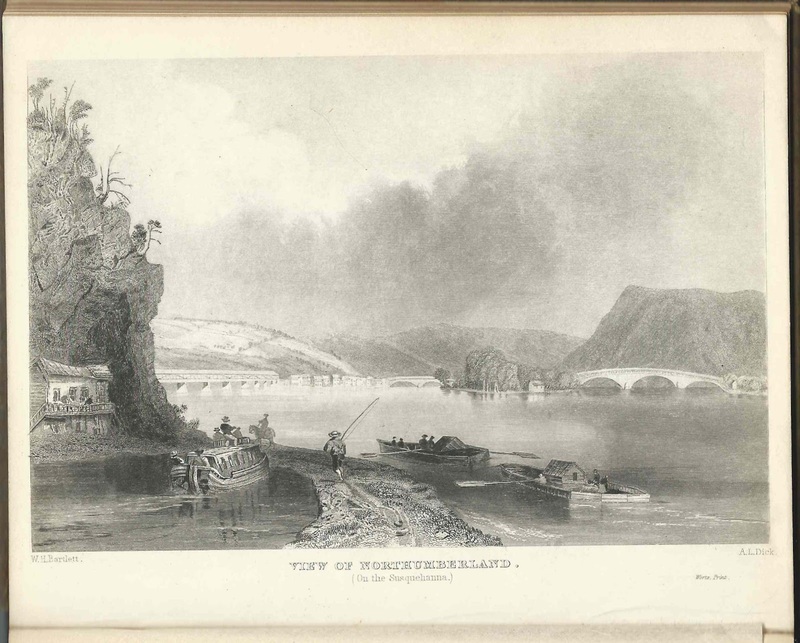 Signed at Hanover, New Hampshire, on October 1, 1855. Surname possibly Moore or Mooers or Moores. Abby A. Judson, signed at Hanover, New Hampshire, on October 1, 1855. Presumably the Abbie A. Judson who was born in Burma in 1835, the daughter of missionary Adoniram Judson and his second wife Sarah (Hall) Boardman Judson. Abby became a noted spiritualist. Nellie Lee, signed at Hanover, New Hampshire, on September 18, 1856. Not sure if Lee is a middle name or surname. B. Silliman, Sr., signed at Hanover, New Hampshire, on August 23, 1852. Presumably Professor Benjamin Silliman, Sr.; Hattie may have been his grandchild Harriet Trumbull Hubbard. H. B. Stowe. Could this be Harriet Beecher Stowe? Name might possibly be Willie Stow or Stowe, signed at Hanover, New Hampshire, on September 28, 1852. The first letter in the given name looks more like an O, and one of the l's could be a k.
Willia Thompson; given name could be Willie or William without last letter. H. Stuart Webster, signed at New York on November 1, 1852. Jenny A. Woolsey, signed at Convent de St. Foi. Not sure of "Jenny" and not sure of "Convent"
Pam: Very interesting about the H.B. Stowe signature! The author of Uncle Tom's Cabin was born Harriet Elizabeth Beecher, BUT she and her husband, Calvin Ellis Stowe, had seven children (four of whom died before Harriet did). One of their two daughters was named "Harriet Beecher Stowe" and apparently was known as "Hattie." According to Wikipedia, H.E.B. Stowe and her daughter "Hattie" visited with President Lincoln on Nov. 25, 1862. "Stowe's daughter Hattie reported, "It was a very droll time that we had at the White house I assure you... I will only say now that it was all very funny—and we were ready to explode with laughter all the while." Thanks for that insight, John! I amended the post to show the possibility. And it wouldn't be surprising that mother and daughter had similar handwriting.